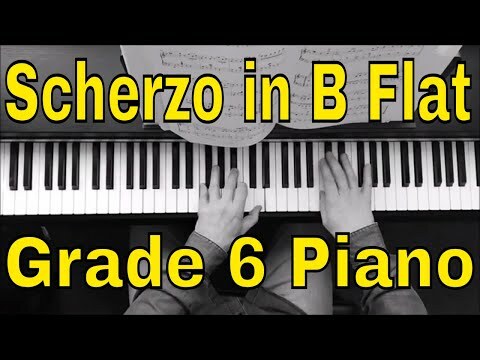 Scherzo in B flat, (No.1 from Two Scherzos, D593). Grade 6 Piano ABRSM 2019/2020 B3. The first thing to note in order to achieve a good performance, is the title itself. "Scherzo" implies something playful and you need to explore the humorous moments of this piece. Generally, the dynamic level is soft and will require a light touch, but there are some dramatic contrasts, such as the fortissimo of bar 13. Grace notes should be played on the beat with a cheeky little bite to accentuate their discordant nature. Likewise, lean a little heavier (always in the context of piano) on the dissonances such as the first beats of bars 4, 8 and 12 etc. A touch of pedal on the first two beats of bar 14 (and later in bar 48), will not only make the legato easier on the descending arpeggio, but will add richness to the bolder texture at this point. Notice the fortepiano of bar 17, is NOT repeated in the following bar, which should be treated as an echo of the previous. In bars 21-23, be extra careful which notes are legato and which are detached as it frequently swaps between the two. Aim for a dramatic crescendo up to ffz in bar 31, possibly easing off the dynamic a little earlier than the marked "decresc". There should be no problem with the page turn, due to the pause in bar 36, so take time to change gear back into the opening playful mood after the drama of the preceding bars. The Trio section needs a complete change of mood, it is much more legato and calm. Turns should always be graceful and elegant, never sounding rushed. Also be very attentive to the lengths of notes which frequently overlap. For example, in bar 51, the three LH notes should all be sounding by the end of the bar, but in bar 52, the top D of the LH releases on the third beat. Similarly, make sure to observe the rest of the RH in bar 54. Another point of interest, is the incessant B flat note in the LH, on the 2nd beat of the majority of bars in this trio section. It seems this was by design, rather than by accident, as Schubert even puts an accent on it, wanting this menacing repeated note (amongst the contrasting calm) to stand out. Besure to do the page turn back to the Da Capo in your practice, (even if just for the first few bars) as it is not unknown in an exam for students to stop at the end of the Trio, just out of habit, because they never bother going back in their practice.